The conversion rate is directly affected by a company’s landing page design. The volume of conversions can drop when a company’s landing page contains numerous flaws. 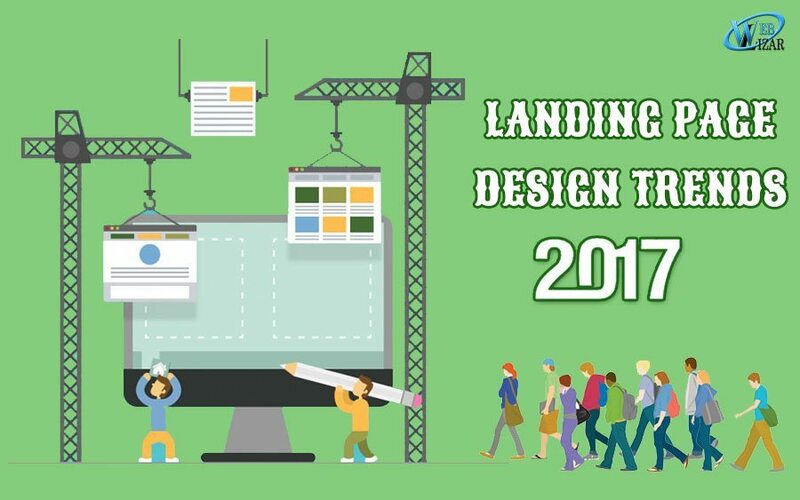 The following article will discuss the main goals of landing pages, common landing page design flaws, and trending landing pages set to appear in 2017. Prompt visitors to register their information. Send promotions and information based on the visitor’s profile and personal preferences. Establish the benefits of visiting the target site rather than going to a competitor. Answer the visitor’s questions and prompt a call-to-action. Clearly, express the company’s core beliefs within your product or service’s promotion. Provide the company’s contact details. Encourage and engage a connection with the visitor through appealing offers or content. A complex landing page will lower your site speed unless you have quality web hosting. The one thing that Web surfers hate most is waiting for a slow page to load. They’re less inclined to read a landing page that doesn’t provide them with information quickly. Web visitors don’t respond well to a website that’s too wordy, they just want to read the information they’re looking for and make their decision in as little time as possible. While it’s good to inform visitors of what a website is about, the landing page should be designed in such a way that’s easy to solicit a call-to-action. Aside from adding too much text, inserting images that relate to a landing page’s text creates a dynamic message. However, adding too many images or captions is just as bad as adding too much text to a landing page. A visitor’s curiosity is first stimulated by reading a landing page’s headline. When the landing page’s heading doesn’t effectively describe what’s being offered, the visitor won’t have any reason to keep reading or to respond to a call-to-action. Using stock photos on a landing page translates as an unimaginative, generic site to visitors. People need to see creative images that give the text their reading life. Relevant images also convey that a company is willing to do more than the bare minimum to keep helping their customers make their purchasing decisions. A landing page that has no continuity with its keyword distribution will make it appear irrelevant and generic to locally based visitors. The worst thing a company could do is to create keyword text that isn’t specifically tailored to its ads and messages. It’s also a mistake not to create a descriptive title of what the landing page is all about. Landing pages are also essential to attract visitors using mobile devices. The presentation, load speed, and call-to-action distribution will need to change for someone using a smartphone or a tablet. Understandably, the attention span and purchase behavior of a mobile device user is even shorter on average than someone using a PC or laptop. Thus, a landing page that fails to take these things in consideration will have lower conversion rates. With so much riding on making a profit, it makes sense that a landing page must be the most effective tool to generate leads. It also cuts costs on advertising since this type of website page can create higher conversions. Landing page designs have adapted over the years to the ever-changing needs of users. The following three landing page examples are some of the most effective to appear in 2017. Companies that stay abreast of online trends find it necessary to change their landing page’s appearance based on these trends. This action mainly depends on the length of the campaign and its desired objectives. The following three types of landing pages are examples of what a visitor can expect to see in 2017. Although short landing pages can be extremely effective at converting site visitors, the ongoing landing page trend in 2017 appears to be moving in the opposite direction. The length of the average landing page now runs below the page fold. More and more companies realize that they don’t have to cram all of their information above the fold in order to snag a conversion. The concept affecting this new trend is that consumers are interested in getting relevant information about their buying options. When a consumer receives extensive details about a product or service, they can make a more informed decision before they finally make their purchase. A company can use a longer landing page as a strategy to insert several calls-to-action that comfortably motivates the visitor to convert. The key to remember when adding several calls-to-actions in a landing page is to do it in such a way that is natural without taking the visitor’s focus from the main message of the landing page. A less common landing page design is one that uses split screens. A split screen design includes information that is grouped into big blocks of content. This landing page style makes it simpler for the brain to process several types of info quickly. For example, A landing page may visually guide visitors to see an image on the left that explains the corresponding text found on the right. A landing page could have a design that is visually distracting. Companies know that they only have a few seconds to grab a visitor’s attention to their landing page. So anything on a landing page that could hinder a visitor’s readability is removed such as navigation bars and footers. If navigation bars are still to be used, it’s suggested that they are added below the first fold of the landing page to keep readers from being distracted from its information. Although most people still won’t convert after reading a well-designed landing page, it’s crucial to provide a positive browsing experience. Flawed landing page designs will inevitably lead to conversion rate problems. When a landing page’s message is too wordy, too complex, or has an uninteresting headline, a company’s conversion rate will suffer. Effective landing pages target visitors with a concise relevant message that is paired with related images. Intent, purchase behavior and attention levels, instantly change when designing landing pages for mobile users. So it’s important to motivate the reader to a call-to-action as clearly and directly as quickly as possible. Talking about landing page design trends, I remember an old post that we posted a while ago about the same topic, I think you might want to check out those so that nothing is left for considering for that best design. Check out the old blog here, How To Create A Successful Landing Page For Your Website.